Looking to register for the May luncheon? Click here. Register and pay online or email us at shorelinechamber@gmail.com and pay cash, check or card at the door. Please register by April 10. Paula Bates was named COPS Officer in October 2016. Paula’s role is to meet with individuals, neighborhood groups, organizations, and businesses to discuss crime prevention and public safety issues. At the luncheon, Paula will introduce herself and her new role as it applies to Shoreline businesses. She will also briefly discuss a new City of Shoreline initiative to focus on engaging the business community in promoting and enhancing safety. There will be plenty of time for questions and answers. Paula started her law enforcement career in 1999 with Bellevue Police Department as a support officer. 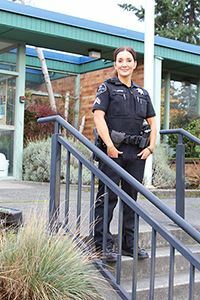 She was hired by King County Sheriff’s Office in 2000 and spent her first 6 years working patrol at the North Precinct and Sammamish. She transferred to Shoreline in 2006 where she worked in the Shoreline traffic unit as a training officer and Master Police Officer (corporal). In 2011, she became a detective for Sound Transit Police. Paula returned to Shoreline in 2015 as a training officer.